Artist's illustration of a Shenzhou spacecraft (left) docked with a Tiangong space lab (right). China's second space lab dived unexpectedly toward Earth this month, just two months after its predecessor crashed uncontrolled into our planet's atmosphere. The uncrewed Tiangong-2 vehicle descended about 59 miles (95 kilometers) two weeks ago, then popped back up to its previous 242-mile-high (390 km) orbit on June 22, according to Jonathan McDowell, an astronomer at the Harvard-Smithsonian Center for Astrophysics who keeps tabs on many of the more interesting objects circling Earth. McDowell thinks China performed this month's exercise primarily to gather additional data about the subsystems aboard Tiangong-2, which launched in September 2016. Many of these subsystems — particularly the space lab's thrusters — will likely be incorporated into the space station the nation aims to have up and running in Earth orbit by 2022, he said. Chinese officials therefore probably "want more baseline on how the propulsion system works, how reliable it is, how well it works after two years in space," McDowell told Space.com. As a sort of bonus, McDowell added, the drop-and-rise move also used up some fuel, making Tiangong-2's eventual re-entry less explosive. It's unclear when that re-entry will occur. But this month's maneuvers show that China still has control over the 9.5-ton (8.6 metric tons) Tiangong-2, so they could map out a directed deorbiting campaign now if they so wished, McDowell stressed. It will only take a couple hundred kilograms of fuel to deorbit Tiangong-2 in such a manner, he said. And McDowell estimates that the space lab probably still has about 700 kg (1,540 lbs.) of its original 1,000 kg (2,200 lbs.) propellant load left. Tiangong-1's demise, on the other hand, was not controlled. China's first space lab launched in September 2011 and hosted two visiting astronaut crews, in June 2012 and June 2013. 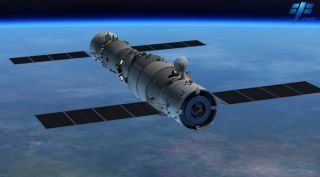 Data transmission between Tiangong-1 and its handlers ceased in March 2016, and the huge craft plunged to Earth on April 1 of this year, breaking apart and burning up over the southern Pacific Ocean. The re-entry caused no reported injuries or damage to structures. By coincidence, Tiangong-1 came back to Earth near "Point Nemo," the isolated stretch of water where mission planners try to ditch their dying or derelict spacecraft. The two Tiangong craft, whose Mandarin name translates as "heavenly palace," were both designed to help China master the skills needed to build a full-on space station, such as rendezvous and docking technology. Tiangong-2 hosted one set of astronauts, in October-November 2016, and served as the base for multiple robotic refueling demonstrations, the last of which wrapped up in September 2017. Tiangong-2 had been in a sort of hibernation since then, performing minor engine firings every few months to maintain its orbit. Those maneuvers, and this month's descent and rise, show that China still has control over the space lab. But Tiangong-2's handlers shouldn't take this state of affairs for granted, McDowell said. "What you don't want them to do is take the wrong lesson from this test, which is, 'Oh, it's working fine; we'll keep in orbit for three more years' — and then discover two years from now that something breaks, and it's not fine anymore," he said.